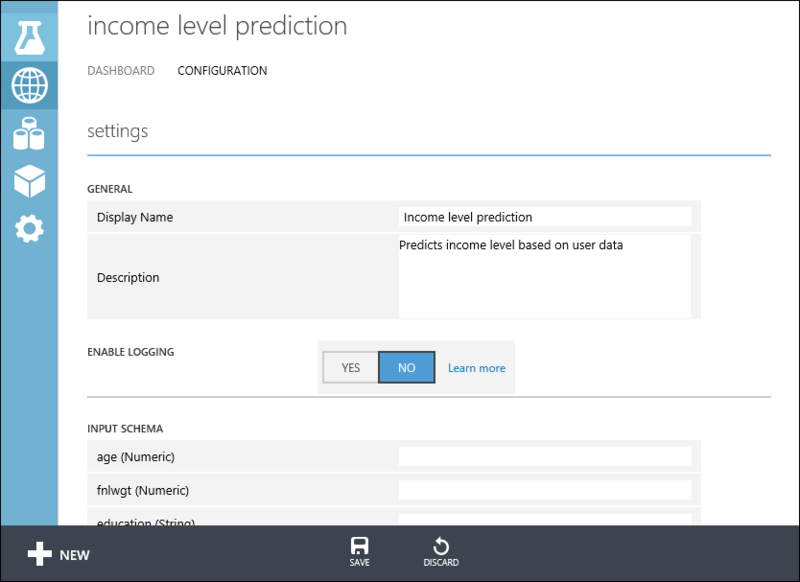 Azure Machine Learning Studio では、予測分析ソリューションをビルドしてテストできます。Azure Machine Learning Studio enables you to build and test a predictive analytic solution. その後、Web サービスとしてソリューションをデプロイできます。Then you can deploy the solution as a web service. Machine Learning Studio Web サービスは、アプリケーションと Machine Learning Studio ワークフローのスコア付けモデルの間のインターフェイスを提供します。Machine Learning Studio web services provide an interface between an application and a Machine Learning Studio workflow scoring model. 外部のアプリケーションは、Machine Learning Studio ワークフローのスコア付けモデルとリアルタイムで通信できます。An external application can communicate with a Machine Learning Studio workflow scoring model in real time. Machine Learning Studio Web サービスを呼び出すと、予測結果が外部のアプリケーションに返されます。A call to a Machine Learning Studio web service returns prediction results to an external application. Web サービスの呼び出しを実行するには、Web サービスのデプロイ時に作成された API キーを渡します。To make a call to a web service, you pass an API key that was created when you deployed the web service. Machine Learning Studio Web サービスは、Web プログラミング プロジェクトで広く使われているアーキテクチャの REST に基づいています。A Machine Learning Studio web service is based on REST, a popular architecture choice for web programming projects. 要求応答サービス (RRS):待ち時間が短くスケーラビリティが高いサービス。1 つのデータ レコードをスコア付けします。Request-Response Service (RRS): A low latency, highly scalable service that scores a single data record. 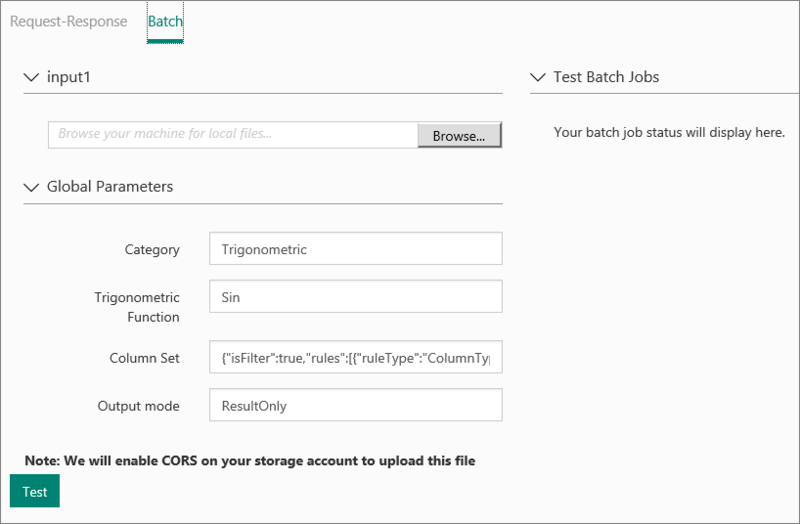 バッチ実行サービス (BES):非同期のサービス。データ レコードのバッチをスコア付けします。Batch Execution Service (BES): An asynchronous service that scores a batch of data records. BES への入力は、RRS で使用されるデータ入力と似ています。The input for BES is like data input that RRS uses. 主な違いは、BES が、Azure Blob Storage、Azure Table Storage、Azure SQL Database、HDInsight (Hive クエリ)、HTTP ソースなど、さまざまなソースからレコードのブロックを読み取る点です。The main difference is that BES reads a block of records from a variety of sources, such as Azure Blob storage, Azure Table storage, Azure SQL Database, HDInsight (hive query), and HTTP sources. トレーニング実験を作成する - Studio では、供給するトレーニング データを活用した予測分析モデルを、大規模な組み込みの機械学習アルゴリズムを使用して、トレーニングおよびテストできます。Create a training experiment - In Studio, you can train and test a predictive analytics model using training data that you supply, using a large set of built-in machine learning algorithms. 予測実験に変換する - 既存のデータでモデルが学習され、それを使用して新しいデータをスコア付けする準備ができると、予測用に実験を用意し、合理化します。Convert it to a predictive experiment - Once your model has been trained with existing data and you're ready to use it to score new data, you prepare and streamline your experiment for predictions. これを**新しい Web サービス** または**従来の Web サービス** としてデプロイする - Azure Web サービスとして予測実験をデプロイすると、ユーザーはデータをモデルに送信して、モデルの予測を受信できるようになります。Deploy it as a New web service or a Classic web service - When you deploy your predictive experiment as an Azure web service, users can send data to your model and receive your model's predictions. 予測分析モデルを学習するには、Azure Machine Learning Studio を使用してトレーニング実験を作成します。ここではトレーニング データを読み込み、必要に応じてデータを用意し、機械学習アルゴリズムに適用し、結果を評価するさまざまなモジュールを含めることができます。To train a predictive analytics model, you use Azure Machine Learning Studio to create a training experiment where you include various modules to load training data, prepare the data as necessary, apply machine learning algorithms, and evaluate the results. 実験を繰り返し、別の機械学習アルゴリズムを試して結果を比較したり評価したりできます。You can iterate on an experiment and try different machine learning algorithms to compare and evaluate the results. モデルのトレーニングが終了したら、トレーニング実験を予測実験に変換して、新しいデータのスコア付けを行うことができます。Once you've trained your model, you're ready to convert your training experiment into a predictive experiment to score new data. 予測実験に変換することで、トレーニングされたモデルをスコア付け Web サービスとしてデプロイできるようになります。By converting to a predictive experiment, you're getting your trained model ready to be deployed as a scoring web service. Web サービスのユーザーがモデルに入力データを送信し、モデルは予測結果を返します。Users of the web service can send input data to your model and your model will send back the prediction results. 予測実験を変換する際は、モデルが他のユーザーに使用されることを想定しておいてください。As you convert to a predictive experiment, keep in mind how you expect your model to be used by others. トレーニング実験を予測実験に変換するには、実験キャンバスの下部にある [実行] をクリックし、[Web サービスの設定] をクリックして、[予測 Web サービス] を選択します。To convert your training experiment to a predictive experiment, click Run at the bottom of the experiment canvas, click Set Up Web Service, then select Predictive Web Service. この変換を実行する方法については、Azure Machine Learning Studio でのデプロイのためにモデルを準備する方法に関するページを参照してください。For more information on how to perform this conversion, see How to prepare your model for deployment in Azure Machine Learning Studio. 次の手順では、新しい Web サービスとして予測実験をデプロイする方法を説明します。The following steps describe deploying a predictive experiment as a New web service. 実験は、従来の Web サービスとしてデプロイすることもできます。You can also deploy the experiment as Classic web service. 予測実験の準備ができたので、新しい (Resource Manager ベースの) Azure Web サービスとしてこれをデプロイできます。Now that the predictive experiment has been prepared, you can deploy it as a new (Resource Manager-based) Azure web service. Web サービスを使用してユーザーはデータをモデルに送信でき、モデルは予測を返します。Using the web service, users can send data to your model and the model will return its predictions. 予測実験をデプロイするには、実験キャンバスの下部にある [実行] をクリックします。To deploy your predictive experiment, click Run at the bottom of the experiment canvas. 実験の実行が終了したら [Web サービスのデプロイ] をクリックし、Web サービスのデプロイ 新規 を選択します。Once the experiment has finished running, click Deploy Web Service and select Deploy Web Service New. Machine Learning Studio Web サービス ポータルの [デプロイ] ページが開きます。The deployment page of the Machine Learning Studio Web Service portal opens. 新しい Web サービスをデプロイするには、Web サービスのデプロイ先となるサブスクリプションで十分なアクセス許可を持っている必要があります。To deploy a New web service you must have sufficient permissions in the subscription to which you deploying the web service. 詳しくは、「Azure Machine Learning Web サービス ポータルを使用して Web サービスを管理する」をご覧ください。For more information see, Manage a Web service using the Azure Machine Learning Web Services portal. [Deploy Experiment (実験のデプロイ]) ページで、Web サービスの名前を入力します。On the Deploy Experiment page, enter a name for the web service. 料金プランを選択します。Select a pricing plan. 既存の料金プランがある場合はそのプランを選択できます。ない場合は、サービス用に新しい料金プランを作成する必要があります。If you have an existing pricing plan you can select it, otherwise you must create a new price plan for the service. [Price Plan (料金プラン)] ドロップダウンで、既存のプランを選択するか、[Select new plan (新しいプランを選択する)] オプションを選択します。In the Price Plan drop down, select an existing plan or select the Select new plan option. [プラン名] に、請求書でプランを識別する名前を入力します。In Plan Name, type a name that will identify the plan on your bill. [Monthly Plan Tiers (月額プラン レベル)] のいずれか 1 つを選択します。Select one of the Monthly Plan Tiers. プラン レベルは既定では既定のリージョンのプランになり、Web サービスはそのリージョンにデプロイされます。The plan tiers default to the plans for your default region and your web service is deployed to that region. [デプロイ] をクリックすると、Web サービスの [クイック スタート] ページが開きます。Click Deploy and the Quickstart page for your web service opens. Web サービスの [クイック スタート] ページでは、新しい Web サービスの作成後に実行するほとんどの一般的なタスクにアクセスし、そのガイダンスを得ることができます。The web service Quickstart page gives you access and guidance on the most common tasks you will perform after creating a web service. ここから、[テスト] ページと [Consume (使用)] ページの両方に簡単にアクセスできます。From here, you can easily access both the Test page and Consume page. 新しい Web サービスをテストするには、一般的なタスクの下の [Test web service (Web サービスのテスト)] をクリックします。To test your new web service, click Test web service under common tasks. [テスト] ページでは、Web サービスを要求応答サービス (RRS) またはバッチ実行サービス (BES) としてテストできます。On the Test page, you can test your web service as a Request-Response Service (RRS) or a Batch Execution service (BES). RRS テストのページには、入力、出力、および実験用に定義したすべてのグローバル パラメーターが表示されます。The RRS test page displays the inputs, outputs, and any global parameters that you have defined for the experiment. Web サービスをテストするには、手動で適切な入力値を入力するか、テスト値を含むコンマ区切り値 (CSV) の書式設定されたファイルを指定できます。To test the web service, you can manually enter appropriate values for the inputs or supply a comma separated value (CSV) formatted file containing the test values. RRS を使用してテストするには、リスト ビュー モードから適切な入力値を入力し、 [Test Request-Response (要求応答のテスト)] をクリックします。To test using RRS, from the list view mode, enter appropriate values for the inputs and click Test Request-Response. 予測結果は、左側の出力列に表示されます。Your prediction results display in the output column to the left. BES をテストするには、 [バッチ] をクリックします。To test your BES, click Batch. バッチ テストのページで、入力の下の [参照] をクリックし、適切なサンプル値を含む CSV ファイルを選択します。On the Batch test page, click Browse under your input and select a CSV file containing appropriate sample values. CSV ファイルがなく、Machine Learning Studio を使用して予測実験を作成した場合は、予測実験用のデータ セットをダウンロードし、それを使用できます。If you don't have a CSV file, and you created your predictive experiment using Machine Learning Studio, you can download the data set for your predictive experiment and use it. データ セットをダウンロードするには、Machine Learning Studio を開きます。To download the data set, open Machine Learning Studio. 予測実験を開き、実験の入力を右クリックします。Open your predictive experiment and right click the input for your experiment. コンテキスト メニューの [データセット] を選択し、[ダウンロード] を選択します。From the context menu, select dataset and then select Download. [Test] をクリックします。Click Test. バッチ実行ジョブの進行状況は、[Test Batch Jobs (バッチ ジョブのテスト)] の右下に表示されます。The status of your Batch Execution job displays to the right under Test Batch Jobs. [構成] ページでは、Web サービスの説明やタイトルの変更、ストレージ アカウント キーの更新、およびサンプル データの有効化を行うことができます。On the CONFIGURATION page, you can change the description, title, update the storage account key, and enable sample data for your web service. Machine Learning Studio から Web サービスをデプロイすると、サービスにデータを送信し、プログラムからの応答が得られます。Once you deploy your web service from Machine Learning Studio, you can send data to the service and receive responses programmatically. [Consume (使用)] ページでは、Web サービスへのアクセスに必要なすべての情報が提供されます。The Consume page provides all the information you need to access your web service. たとえば、API キーは、サービスへの承認済みアクセスを許可するために提供されます。For example, the API key is provided to allow authorized access to the service. Machine Learning Studio Web サービスへのアクセスの詳細については、「Azure Machine Learning Studio Web サービスを使用する方法」を参照してください。For more information about accessing a Machine Learning Studio web service, see How to consume an Azure Machine Learning Studio Web service. 新しい Web サービスの Machine Learning Studio Web サービス ポータルを管理することができます。You can manage your New web services Machine Learning Studio Web Services portal. メイン ポータル ページ で [Web サービス] をクリックします。From the main portal page, click Web Services. Web サービスのページでは、サービスを削除したり、コピーしたりすることができます。From the web services page, you can delete or copy a service. 特定のサービスを監視するには、サービスをクリックし、 [ダッシュボード] をクリックします。To monitor a specific service, click the service and then click Dashboard. Web サービスに関連付けられたバッチ ジョブを監視するには、 [Batch Request Log (バッチ要求ログ)] をクリックします。To monitor batch jobs associated with the web service, click Batch Request Log. 複数のサブスクリプションやワークスペースがなくても、複数のリージョンに新しい Web サービスを簡単にデプロイできます。You can easily deploy a New web service to multiple regions without needing multiple subscriptions or workspaces. 料金は、リージョンに固有なので、Web サービスをデプロイするリージョンごとに課金プランを定義する必要があります。Pricing is region specific, so you need to define a billing plan for each region in which you will deploy the web service. Microsoft Azure Machine Learning Web サービスにサインインします。Sign in to Microsoft Azure Machine Learning Web Services. [プラン] メニュー オプションをクリックします。Click the Plans menu option. [プラン] 概要ページで 新規 をクリックします。On the Plans over view page, click New. [サブスクリプション] ドロップダウンで、新しいプランを配置するサブスクリプションを選択します。From the Subscription dropdown, select the subscription in which the new plan will reside. [地域] ドロップダウンで、新しいプランのリージョンを選択します。From the Region dropdown, select a region for the new plan. 選択したリージョンのプラン オプションが、ページの [Plan Options (プラン オプション)] セクションに表示されます。The Plan Options for the selected region will display in the Plan Options section of the page. [リソース グループ] ドロップダウンで、プランのリソース グループを選択します。From the Resource Group dropdown, select a resource group for the plan. リソース グループの詳細については、「Azure Resource Manager の概要」をご覧ください。From more information on resource groups, see Azure Resource Manager overview. [プラン名] にプランの名前を入力します。In Plan Name type the name of the plan. [Plan Options (プラン オプション)] で、新しいプランの課金レベルをクリックします。Under Plan Options, click the billing level for the new plan. 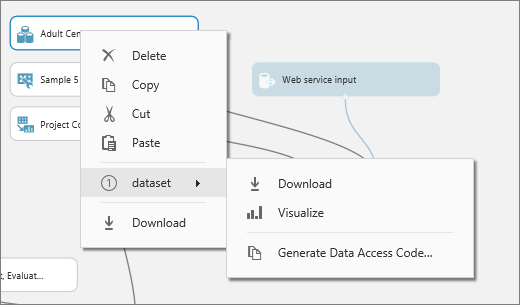 Microsoft Azure Machine Learning Web サービスのページで、[Web サービス] メニュー オプションをクリックします。On the Microsoft Azure Machine Learning Web Services page, click the Web Services menu option. 新しいリージョンにデプロイする Web サービスを選択します。Select the Web Service you are deploying to a new region. [Web サービス名] に Web サービスの新しい名前を入力します。In Web Service Name, type a new name for the web service. [Web service description (Web サービスの説明)] に Web サービスの説明を入力します。In Web service description, type a description for the web service. [サブスクリプション] ドロップダウンで、新しい Web サービスを配置するサブスクリプションを選択します。From the Subscription dropdown, select the subscription in which the new web service will reside. [リソース グループ] ドロップダウンで、Web サービスのリソース グループを選択します。From the Resource Group dropdown, select a resource group for the web service. リソース グループの詳細については、「Azure Resource Manager の概要」をご覧ください。From more information on resource groups, see Azure Resource Manager overview. [地域] ドロップダウンで、Web サービスをデプロイするリージョンを選択します。From the Region dropdown, select the region in which to deploy the web service. [ストレージ アカウント] ドロップダウンで、Web サービスを格納するためのストレージ アカウントを選択します。From the Storage account dropdown, select a storage account in which to store the web service. [Price Plan (価格プラン)] ドロップダウンで、手順 8 で選択したリージョンのプランを選択します。From the Price Plan dropdown, select a plan in the region you selected in step 8. 予測実験の準備を十分に実行したので、従来の Azure Web サービスとしてデプロイできます。Now that the predictive experiment has been sufficiently prepared, you can deploy it as a Classic Azure web service. Web サービスを使用してユーザーはデータをモデルに送信でき、モデルは予測を返します。Using the web service, users can send data to your model and the model will return its predictions. 予測実験をデプロイするには、実験キャンバスの下部にある [実行] をクリックし、[Web サービスのデプロイ] をクリックします。To deploy your predictive experiment, click Run at the bottom of the experiment canvas and then click Deploy Web Service. Web サービスがセットアップされ、Web サービスのダッシュ ボードに配置されます。The web service is set up and you are placed in the web service dashboard. Web サービスは、Machine Learning Studio Web サービス ポータルまたは Machine Learning Studio のいずれかでテストできます。You can test the web service in either the Machine Learning Studio Web Services portal or Machine Learning Studio. 要求 - 応答 Web サービスをテストするには、Web サービス ダッシュボードで [テスト] をクリックします。To test the Request Response web service, click the Test button in the web service dashboard. ダイアログ ボックスが表示され、サービスへのデータの入力が促されます。A dialog pops up to ask you for the input data for the service. これらはスコア付け実験で想定される列になります。These are the columns expected by the scoring experiment. データのセットを入力し、 [OK] をクリックします。Enter a set of data and then click OK. Web サービスによって生成された結果がダッシュボードの下部に表示されます。The results generated by the web service are displayed at the bottom of the dashboard. 「新しい Web サービス」セクションで説明したように、[テスト] プレビュー リンクをクリックして、サービスを Azure Machine Learning Studio Web サービス ポータルでテストできます。You can click the Test preview link to test your service in the Azure Machine Learning Studio Web Services portal as shown previously in the New web service section. バッチ実行サービスをテストするには、[テスト] プレビュー リンクをクリックします。To test the Batch Execution Service, click Test preview link . バッチ テストのページで、入力の下の [参照] をクリックし、適切なサンプル値を含む CSV ファイルを選択します。On the Batch test page, click Browse under your input and select a CSV file containing appropriate sample values. 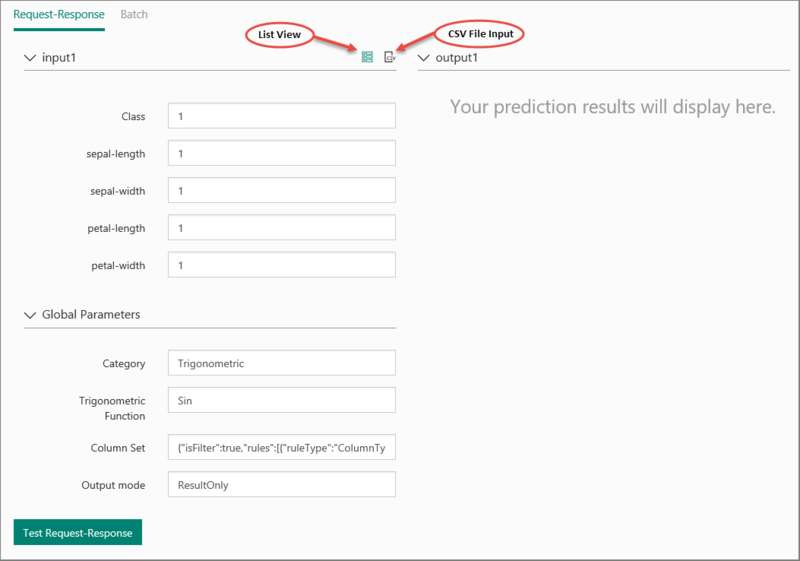 CSV ファイルがなく、Machine Learning Studio を使用して予測実験を作成した場合は、予測実験用のデータ セットをダウンロードし、それを使用できます。If you don't have a CSV file, and you created your predictive experiment using Machine Learning Studio, you can download the data set for your predictive experiment and use it. [構成] ページで、サービスの表示名を変更したり、説明を付けたりできます。On the CONFIGURATION page, you can change the display name of the service and give it a description. この名前と説明は、Web サービスを管理する Azure Portal に表示されます。The name and description is displayed in the Azure portal where you manage your web services. INPUT SCHEMA、OUTPUT SCHEMA、Web SERVICE PARAMETER の各列に文字列を入力し、入力データ、出力データ、Web サービス パラメーターの説明を追加できます。You can provide a description for your input data, output data, and web service parameters by entering a string for each column under INPUT SCHEMA, OUTPUT SCHEMA, and Web SERVICE PARAMETER. これらの説明は、Web サービスのサンプル コードのドキュメントで使用されます。These descriptions are used in the sample code documentation provided for the web service. ログ記録を有効にすれば、Web サービスのアクセスで発生するすべてのエラーを診断できます。You can enable logging to diagnose any failures that you're seeing when your web service is accessed. 詳細については、「Machine Learning Studio Web サービスのログ記録を有効にする」をご覧ください。For more information, see Enable logging for Machine Learning Studio web services. 「新しい Web サービス」セクションで説明した手順と同様に、Web サービスのエンドポイントを Azure Machine Learning Web サービス ポータルで構成することもできます。You can also configure the endpoints for the web service in the Azure Machine Learning Web Services portal similar to the procedure shown previously in the New web service section. オプションは異なりますが、サービスの説明の追加または変更、ログの有効化、テスト用サンプル データの有効化を行うことができます。The options are different, you can add or change the service description, enable logging, and enable sample data for testing. ダッシュ ボードでは、Web サービスへのアクセスが必要なすべての情報が提供されます。The dashboard provides all the information you need to access your web service. たとえば、サービスへの承認済みアクセスを許可する API キーや、コードの記述に役立つ API のヘルプ ページが提供されます。For example, the API key is provided to allow authorized access to the service, and API help pages are provided to help you get started writing your code. Web サービスを監視するために実行できるさまざまな操作があります。There are various of actions you can perform to monitor a web service. 更新および削除することもできます。You can update it, and delete it. デプロイ時に作成される既定のエンドポイントに加え、従来の Web サービスにさらにエンドポイントを追加することもできます。You can also add additional endpoints to a Classic web service in addition to the default endpoint that is created when you deploy it. 詳細については、「Azure Machine Learning Studio ワークスペースの管理」と「Azure Machine Learning Studio Web サービス ポータルを使用して Web サービスを管理する」を参照してください。For more information, see Manage an Azure Machine Learning Studio workspace and Manage a web service using the Azure Machine Learning Studio Web Services portal. 別のトレーニング データでのモデルの更新など、Web サービスに変更を加えたり、元の Web サービスを上書きしてもう一度デプロイしたりできます。You can make changes to your web service, such as updating the model with additional training data, and deploy it again, overwriting the original web service. Web サービスを更新するには、Web サービスのデプロイに使用した元の予測実験を開き、 [名前を付けて保存] をクリックして編集可能なコピーを作成します。To update the web service, open the original predictive experiment you used to deploy the web service and make an editable copy by clicking SAVE AS. 必要な変更を加えて [WEB サービスのデプロイ] をクリックします。Make your changes and then click Deploy Web Service. この実験は前にデプロイ済みであるため、既存のサービスを上書きするか (従来の Web サービス)、更新するか (新しい Web サービス) 確認されます。Because you've deployed this experiment before, you are asked if you want to overwrite (Classic Web Service) or update (New web service) the existing service. [はい] または [更新] をクリックすると、既存の Web サービスが停止され、新しい予測実験が代わりにデプロイされます。Clicking YES or Update stops the existing web service and deploys the new predictive experiment is deployed in its place. たとえば元の Web サービスの構成に変更を加えた場合や新しい表示名または説明を入力した場合、それらの値をもう一度入力する必要が生じます。If you made configuration changes in the original web service, for example, entering a new display name or description, you will need to enter those values again. Web サービスを更新するオプションの 1 つに、モデルをプログラムによって再トレーニングする方法があります。One option for updating your web service is to retrain the model programmatically. 詳細については、「プログラムによる Machine Learning Studio のモデルの再トレーニング」をご覧ください。For more information, see Retrain Machine Learning Studio models programmatically. デプロイのしくみに関する技術的な詳細については、「Machine Learning Studio モデルが実験から運用可能な Web サービスになるまでの過程」をご覧ください。For more technical details on how deployment works, see How a Machine Learning Studio model progresses from an experiment to an operationalized Web service. デプロイのためにモデルを準備する方法については、「Azure Machine Learning Studio でのデプロイのためにモデルを準備する方法」を参照してください。For details on how to get your model ready to deploy, see How to prepare your model for deployment in Azure Machine Learning Studio. REST API を使用して Web サービスにアクセスするには、いくつかの方法があります。There are several ways to consume the REST API and access the web service. 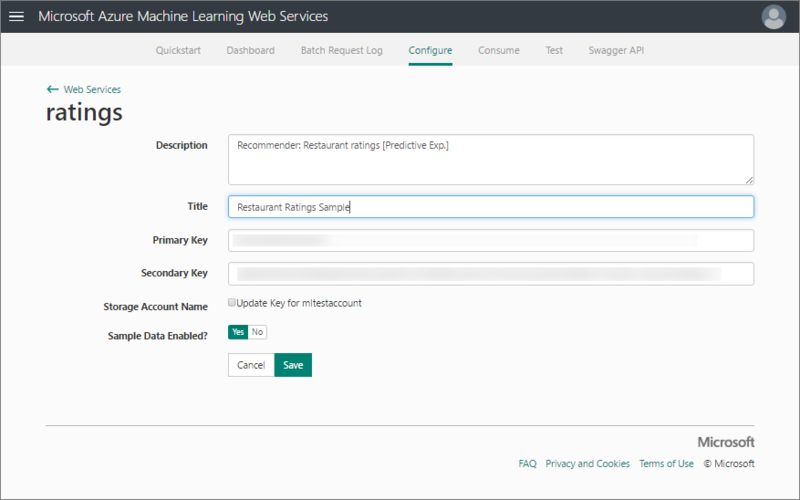 「Azure Machine Learning Studio Web サービスを使用する方法」をご覧ください。See How to consume an Azure Machine Learning Studio web service.